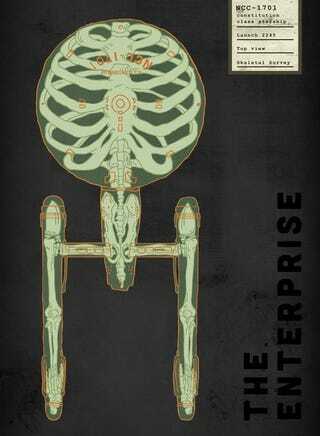 What if spaceships had skeletons inside? Josh Ln takes a peek inside the Enterprise, Serenity, and the Millennium Falcon, and what he finds is surprising. Instead of the usual network of corridors and engines, he uncovers animal-like skeletons beneath the surface of science fiction spaceships. Ln offers prints of his skeletal spaceships at Society6, where he also has colorfully monstrous images of RoboCop, Power Rangers, Boba Fett, and Darth Vader.